I've never been a fan of Microsoft (understatement) and never a fan of Bill Gates as a CEO and tech leader. But I'm a huge fan of Bill Gates as a philanthropist and world leader. During the past year I've had an opportunity to work with a tiny part of the big picture - an organization called Global Good which is fighting Malaria worldwide. They're funded by the Bill and Melinda Gates Foundation, and through them I've come to learn a lot more about Mr. Gates and his contributions and leadership. It's staggering; did you know that his foundation's annual contribution to world health exceeds that of the World Health Organization? The bottom line: Poor countries are not doomed to stay poor. Some of the so-called developing nations have already developed. Many more are on their way. The nations that are still finding their way are not trying to do something unprecedented. They have good examples to learn from. I am optimistic enough about this that I am willing to make a prediction: By 2035, there will be almost no poor countries left in the world. 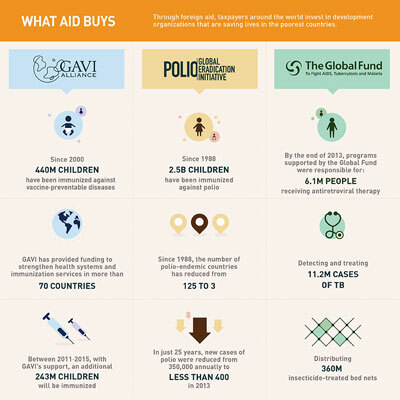 The bottom line: Health aid is a phenomenal investment. 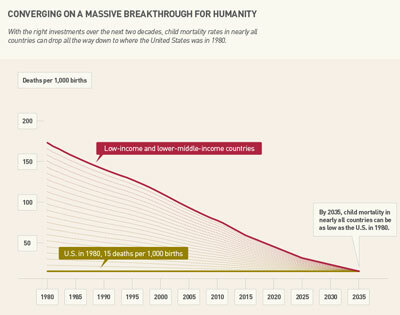 When I look at how many fewer children are dying than 30 years ago, and how many people are living longer and healthier lives, I get quite optimistic about the future. The foundation worked with a group of eminent economists and global health experts to look at what’s possible in the years ahead. As they wrote last month in the medical journal The Lancet, with the right investments and changes in policies, by 2035, every country will have child-mortality rates that are as low as the rate in America or the U.K. in 1980. The bottom line: Saving lives doesn't lead to overpopulation. In fact, it’s quite the opposite. Creating societies where people enjoy basic health, relative prosperity, fundamental equality, and access to contraceptives is the only way to secure a sustainable world. We will build a better future for everyone by giving people the freedom and the power to build a better future for themselves and their families. I wonder if Bill and Melinda Gates ever worry about Unnatural Selection, the idea that the world population is becoming less intelligent because of differential birth rates? Would be most interesting to get their view on this. In the meantime, the work they are doing is amazing and inspiring.